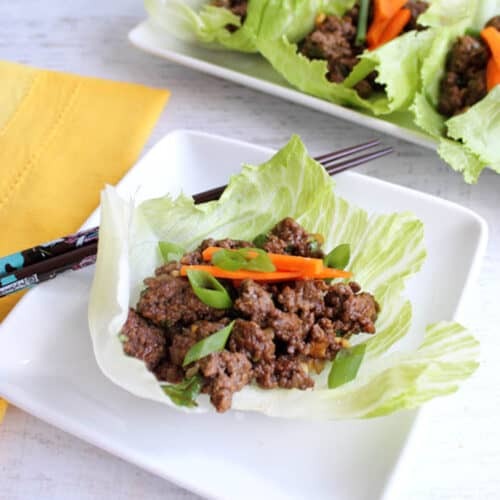 Asian Beef Lettuce Wraps are a quick & easy low carb dinner done in less than 30! Hoisin flavored ground beef wrapped in a lettuce leaf - can you say yum! Saute onion for 3 minutes adding garlic in last minute. Add ground beef and cook until done. Drain fat. Return skillet to heat and stir in hoisin sauce, soy sauce and ginger. Cook until heated through, about 3 minutes. Remove skillet from heat and stir in remaining ingredients except for lettuce leaves and garnishes. Serve on lettuce leave with garnishes on side.